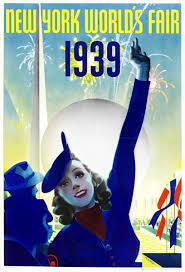 Recently, the New York Times reported about a couple who collect memorabilia from the 1939 New York World Fair. You can read the entire article here. 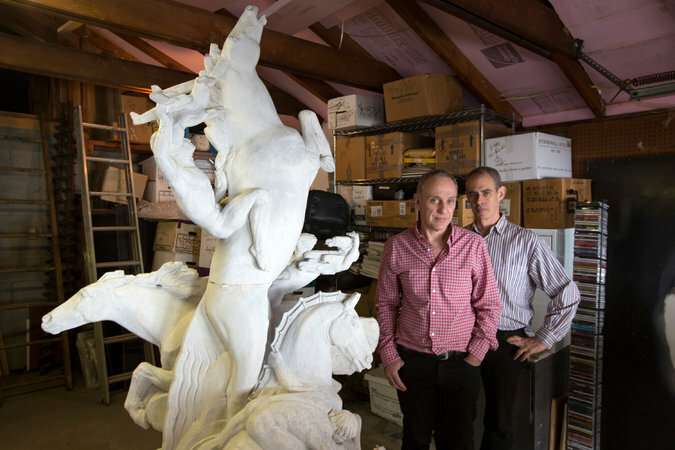 Dr. Roy Goldberg at left and Keith Sherman at the right next to their plaster model of a statue from the 1939 World’s Fair in Queens. Credit James Estrin/The New York Times. Dr. Roy Goldberg and Keith Sherman collect everything from menus to scrapbooks to posters. Even a plaster model of a statue shown at the Fair! 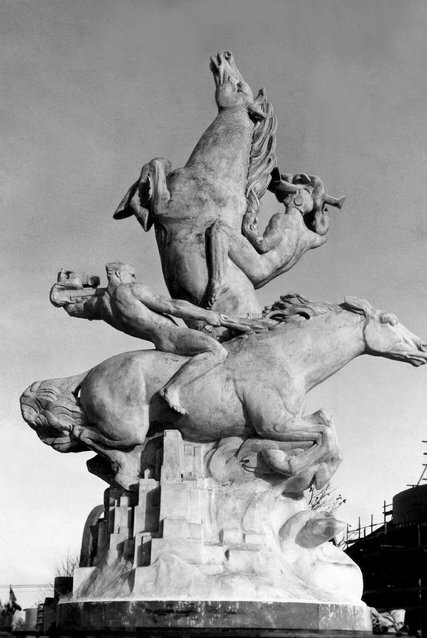 The original, full-sized statue, “Riders of the Elements,” stood on the Avenue of Transportation. The Fair opened 0n April 30, 1939. In this video clip, Franklin Delano Roosevelt opens the Fair, aware of the world’s political tensions. 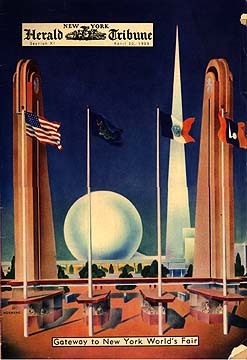 Unlike the eyewitness in that clip, Joan clearly saw how the war influenced the New York World’s Fair in 1939 which she visited the week World War II began in Europe. She had spent the summer at camp. The Fair was advertised to young people as an especially appealing way to learn. Joan would graduate from high school in 1940. This photo was taken the day the Germans crossed into Poland–only when the photo was snapped, no one in the countryside of Michigan was aware that the violence had begun. Joan at summer camp on September 1, 1939. You can she wrote exclamation marks after the date. She writes in her diary that night. I have been reading about the [World War I] dead and am thinking how awful it must be for a mother—or a father—to know their grown son dead. After bearing and bringing through childhood to the prime of his life a son—to find that all this is futile, that all this is ended—all vain. That he died before he began to be himself. To lose a child must be in a deep sense far worse than to lose a husband. 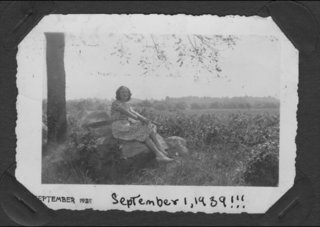 It must make one lose the sense of continuity. . . . A husband dead means that you are, in a way, dead—but to lose a child means you lose immortality—that you shall not go on. . . .
 Ironically, Joan wrote this entry before she knew World War II had begun on this day. The futuristic style of the Fair is reminiscent of another 1939 classic: The Wizard of Oz. 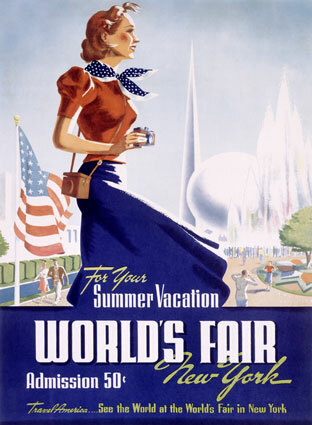 Then she and her mother take the train to New York to visit the World’s Fair. This Fair Newspaper from Monday, September 4, 1939 tells what happened at the fair on the day Joan writes the poem below. If you look at the articles in that link, you can see that museums like the Louvre in Paris, National Gallery in London, and Rijksmuseum in Amsterdam ask the Fair to keep the treasures lent for the duration of the Fair until further instruction. The museums fear for the safety of their treasures should they be returned to a Europe at war. 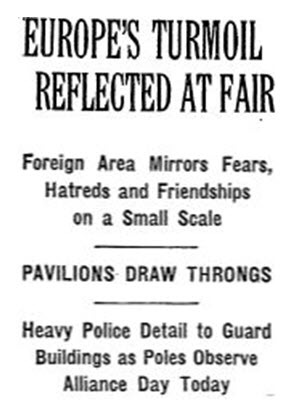 To read much more about how the Fair became politicized, read this fascinating piece here. Article from the first week of World War II, showing how the Fair reflected the world’s turmoil. While at the World’ s Fair, Joan writes this poem, reflecting on the conflagration begun in Europe. Or die, not hearing it again. White shall be this memory forever, I think. The last rose of summer is too beautiful, I fear. Even the wind is white. But they shall know we passed. May still remain in tatters. I will be utterly disappeared. I think we shall remember this peace. Newspaper article from the time Joan was at the Fair.